Prepare the pizza dough per mix directions. Spread dough inside pie tin and up the sides. Top with sauce, cheese, pepperoni. 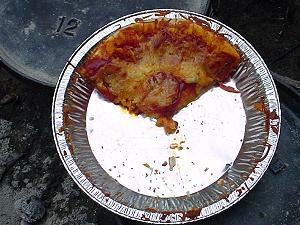 Place 4 pebbles or wads of aluminum foil in dutch oven to raise pie tin off bottom. 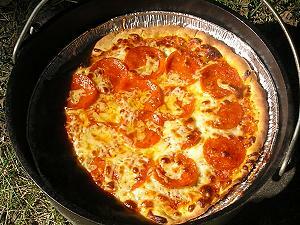 Set pizza in dutch oven. Bake at 375 degrees for about 20 minutes. Let me know how you enjoyed your Dutch Oven Pizza! just an easier thing to do beside the pizza dough mix, you can use a 10"Baboli and still taste great. This would be a great meal!